I returned from the beach late Thursday night to rather chilly temperatures in southern Indiana, but thankfully, no snow. And though it’s cold, spring has sprung nonetheless with many things in bloom and the beginning sprinkling of a very pale green among the trees. That list seems very short for 10 days, but two of the books (The Sea, the Sea and The Lacuna) were quite long. Many folks wisely suggested that instead of debating which books to cram in my suitcase, I should break down and by a Kindle, or Nook, or iPad. This certainly would solve the painful packing process, but as I was brushing the legions of sand off of my books on the beach, I had to wonder how compatible those technologies are with the realities of beach living. What happens when you get your Kindle sandy? Or, as also happened with my books, wet from climbing out of the pool? Or when you’re eating a tomato (the u-pick tomatoes in Florida actually tasting like a real tomato months before we’ll have any such thing up here in Indiana) and reading a book at the same time, and yes, some tomato drips on the book. I know that my old-fashioned books can handle these kinds of abuses. You wipe off the tomato and move on. I’m not sure about their more technologically sophisticated relatives. I need a book that can handle the abuses my life throws at them and survive. Anyone dripped tomato on an iPad yet? I already reviewed The Sea, the Sea, and The Lacuna, so here are two short reviews of The Winter Queen and Heads You Lose for your Sunday enjoyment. 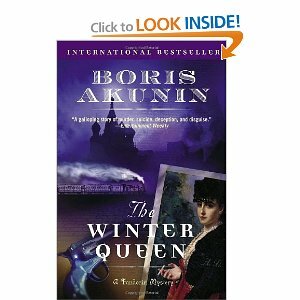 Boris Akunin, The Winter Queen. Akunin goes to great pains to convey to you the intricacies of Russian state bureaucracy in the 1870s and the historical detail in the book appears flawless. In some mysteries, the “mystery” to be solved is just a mirror for something internal to the main character, and in some mysteries, the “mystery” is completely external to the main character. I like that in The Winter Queen, it’s kind of a nice blend between those two. There are characters who I hope will reappear in later books (Count Zurov, or Hippolyte Alexandrovich, for example) and the book ends in a rather dramatic fashion which leaves you wondering, where now, Erast Fandorin? This book is officially released on April 5th, but perhaps should have been scheduled for April 1st. It would have been a nice April Fools Day book, I think. The premise is that Lisa Lutz and David Hayward, former romantic partners, get together to try to write a mystery/thriller novel together. Lutz is a published mystery author, and Hayward is a poet. Both of these things appear to be true. I can’t vouch for whether they were in fact former romantic partners or whether they did, in the past, attempt another book called The Fop, which may or may not have brought about the end of their past romantic relationship. What you get in Heads You Lose is alternating chapters written by each author and, in between, the notes each sends to each other in response to the chapters. Inevitably, some disagreements arise about how the mystery should unfold. Characters become weapons that the authors use against each other. People get killed off not in service of the plot, but for revenge. The characters at time ruminate on how little sense things make, usually in regards to something that happened in the other author’s chapter. All of this is entertaining and never veers towards completely incoherent. Of course, the mystery turns out to be something of a mess. I can’t actually at the moment remember who did it. But the story of the mystery itself becomes interesting mainly for the battle it represents between Lutz and Hayward. In the end, I just began to assume that the brother and sister who are the main characters in the mystery (Paul and Lacey Hansen) are stand-ins for Lutz and Hayward. So the novel is really about the two of them and the process of writing. If you’re looking for a real mystery, don’t read this novel. If you’re looking for a funny and interesting experiment in writing, you should find this enjoyable. My one complaint is that it went on a bit too long. They didn’t really need 300 pages to get to the end, and towards the end, the whole gimmick has well run its course. I started Mice, by Gordon Reece on the very last day of my beach sojourn, and haven’t yet finished it, but expect a review soon. This is also an ARC that will be out in August. And now off to muck around in the garden for the rest of the afternoon! Enjoy your almost-spring day. I'm praying the snow that fell on the East Coast doesn't make its way over to Indiana. Enjoyed your Sunday Salon. I have always heard a lot about The Sea, The Sea by Murdoch. Haven't read it. I am looking forward to your review. No snow is always good, in my book. It's finally leaving here in northcentral Pennsylvania too. I've read a couple of Akunin's Sister Pelagia series, but haven't read any of this series — yet. I might have to look for it now. Just going to the beach period would be wonderful after the awful winter we've had in Connecticut! Your beach reads sound perfect though, and as far as taking the Kindle… I'm not sure I would bring that near the splash zone, but personally wouldn't worry about a little sand. Although there are plenty of places that sell waterproof, airtight covers, I'm not sure I would enjoy reading “through” the cover. That though is a possibility if you're a Kindle owner and worried. Deb, we are snowless so far, though I admit I haven't checked the forecast. Today is beautiful, so hoping this weather heads your way. Heads You Lose does sound like your kind of mystery, as you pretty quickly realize there's not much point in following the plot. Tea, I reviewed The Sea, the Sea on a previous post, here. unfinishedperson.com, good to know Akunin has another series. I love a good mystery, so I'll have to check it out. Laurel Rain-Snow, good to know I'm the only one whose not a messy reader. I know some people are very fussy about preserving their books in pristine condition, but that just makes it hard to read them. I try to be careful with library books, but even so, soup and tomatoes happen! Suzanne, good to know about the waterproof covers. I confess, I haven't been super tempted by a Kindle or other e-reader yet. I'm cautious to abandon a technology that's thousands of years old just yet. I am a big fan of Erast Fandorin!! Glad to meet someone else who has read Boris Akunin.